Pre-heating: The oven prepares materials like metals, substrates, or medium-density fiberboards for coating process. Dry-off: The curing oven helps eliminate moisture or water that gets accumulated during the washing process, which is performed in the pre-treatment stage. Curing: In the process, the coating and the part temperature is elevated to achieve the desired coating. All ovens are designed and manufactured to meet stringent quality and industry standards. All ovens are equipped with Open Drip Proof (ODP) electric motors. These motors enable air circulation through the windings. Also, the motors help prevent liquid drops from entering into the motor within a 15 degree vertical angle. The oven has an aluminized steel six-inch insulated panel walls, and ceiling. ACE curing ovens are equipped with IRI or FM insurance-approved controls. All ovens are equipped with Honeywell, Allen Bradley, and MAXON components. Duct work is designed to minimize or strictly avoid direct air impingement. 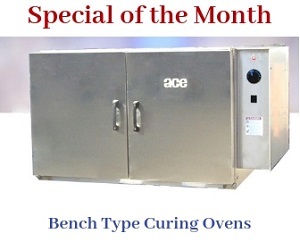 ACE curing ovens can be automatically shut down. These ovens are available in over twenty standard sizes, and are designed operating temperatures up to 500 oF. The ovens can also be availed in custom sizes depending on the application requirements. ACE batch ovens are proven to provide the following benefits. The ovens are provided with well-defined designs, which inform about the complete assembly, start up, as well as operational instructions. Overall costs of operation, and maintenance are significantly reduced. The ovens offer dependable and reliable operation. Insulated 6" panels & trim package are completely palletized. We provide the fabricated doors. These doors are provided with all necessary hardware. The ductwork is fabricated, notched, and pre-formed. All mounting hardware, as well as fasteners, are supplied with the oven parts. We also provide a detailed instruction manual along with the parts. The manual offers easy-to-follow instructions on complete assembly, start-up, and operations. Are you planning to invest in a performance-oriented curing oven? If yes, you should rely on ACE curing ovens. If you have specific questions on any of the aforementioned models, please feel free to contact us anytime. Armature Coil is one of the leading curing oven manufacturers in the US.